requires the Commissioner of Education to provide the governing bodies of regional school units and alternative organizational structures with the computation and the amount of the allocation of school subsidy that the commissioner has estimated for the regional school units and each member municipality in the regional school unit or for the alternative organizational structure and each member entity in the alternative organizational structure. directs the Department of Education to convene a stakeholders group to analyze the school funding formula. The department must present a plan and timeline to the Joint Standing Committee on Education and Cultural Affairs by May 1, 2009 and a report with its recommendations by November 1, 2009. The Joint Standing Committee on Education and Cultural Affairs may submit legislation to the Second Regular Session of the 124th Legislature. 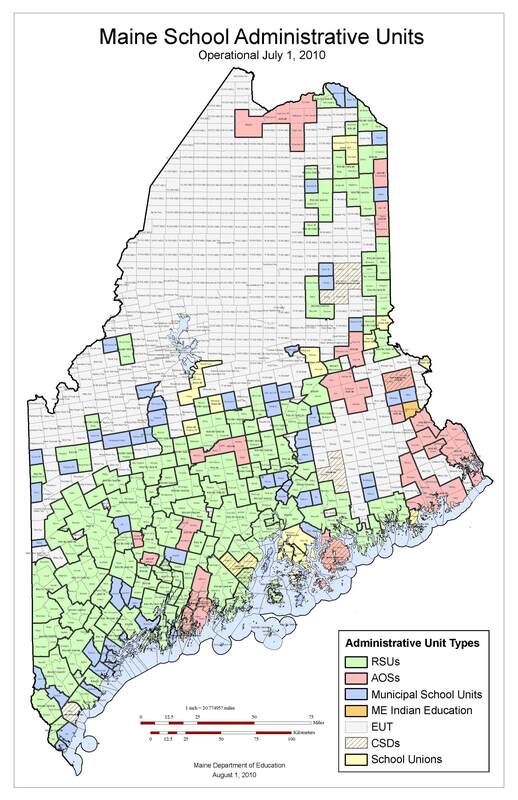 The School Reorganization law was designed (a questionable term, I'll admit) to limit the number of system-wide administrators by constraining the number of school systems statewide. That premise was faulty by its nature since there was no requirement that RSUs or AOSs actually spend less on central administration. Beyond that, though, there is nothing in the EPS formula which actually forces, encourages or penalizes SAUs for not eliminating Central Office positions. In small school systems around the state (many of which voted "No" to school reorganizations plans in November or January), there are still full-time superintendents, full or part-time Curriculum Coordinators, full or part-time Special Education Directors, full and/or part-time clerical staff. There may even be a few full or part-time Assistant Superintendents. This fiscal year, the reorganization law dropped the amount allowed for central-office administration by 1/2. The law then "penalizes" non-conforming school systems by further dropping the EPS amount for central-office administration by another 1/2 next fiscal year. But - and here's the critical point - school boards face no penalty for reallocating the school-funding dollars ostensibly meant for other school functions back into system-wide administration. Because the EPS formula is simply that - a formula - school systems get the state dollars, as well as their own local funds, as a lump sum which can be allocated as they choose or negotiate. If they decide to hire fewer teachers in favor of keeping their F/T superintendent, that's their choice. So, in a school system with 300 students, the EPS allocation for system-wide administration is about $62,000 for this fiscal year. If the SAU is non-conforming (in other words, voted "no" to school reorganization), the EPS allocation for next fiscal year will be about $31,000. If the SAU employs even just a F/T superintendent and a F/T clerical person, the cost is going to be well over that $31,000. The money has to come from some other part of the budget. 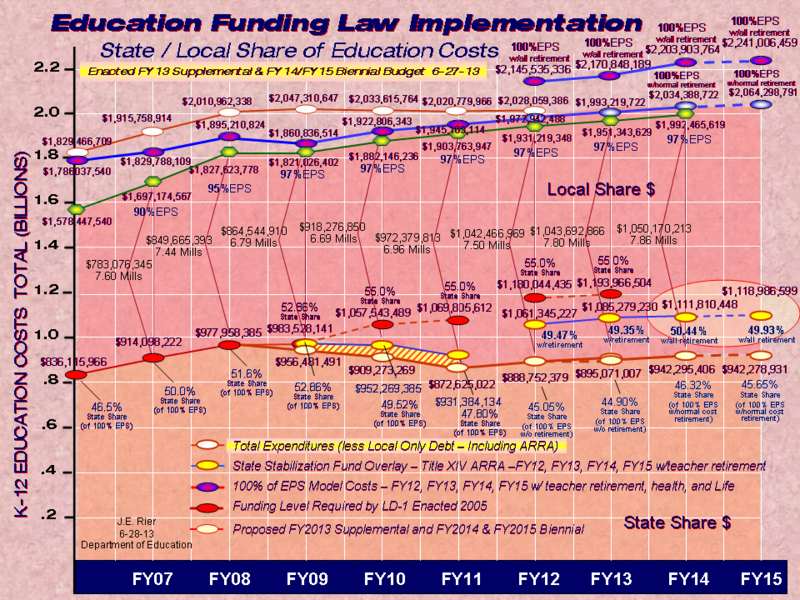 My conclusion: the current school reorganization law does not save money on system-wide administration. School reorganization penalties do not save money on system-wide administration, either. The best solution: repeal the school reorganization law. The next best: figure out a way to actually cut back on central office administration and change the education funding laws to make that happen.